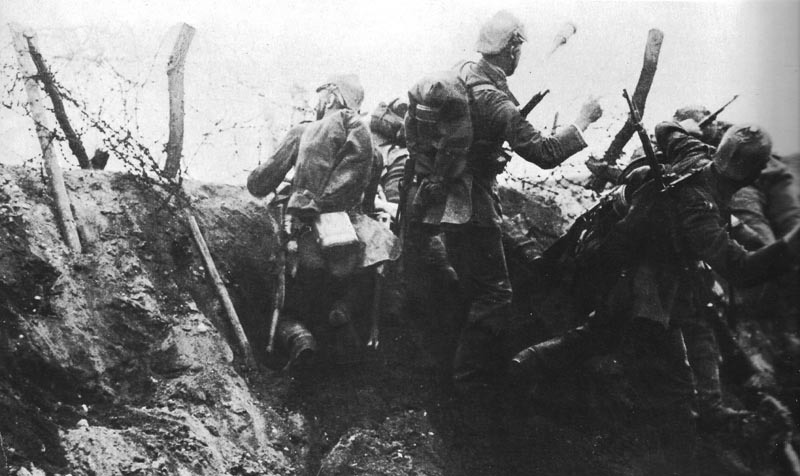 German troops at Verdun scramble up the soft earth of a devastated trench to launch a grenade attack. Verdun: Bloody struggle round Fresnes and salient. Falkenhayn finally agrees to attack on west bank of Meuse, releases 4 divisions and 84 heavy guns for it). February losses: 30,000 French, 25,000 Germans. Salonika: Malaria discoverer Sir R Ross writes to warn British Army Medical Director General Keogh, urging regular quinine and anti-mosquito measures: ‘You still have about two months grace before General Malaria comes in the field…’. Italian Front: Mussolini promoted corporal for steady service. Mesopotamia, Kut: Battle casualties to date 2,927 plus 443 deaths from disease. Germany: Chancellor Bethmann memo to Kaiser expresses fear that unrestricted U-boat warfare will precipitate US intervention. U­-boat campaign to resume in War Zone, but only enemy vessels to be attacked inside or out. North Sea: 20­ minutes action between German raider Greif (crew 306 men) and British AMC Alcantara northeast of Shetlands, both sunk. Möwe gets home as Royal Navy radio D/F assumes she is sailing westward. During February record of 14 British ships sunk (4 in Mediterranean) by mines, number equalled only in April and May 1917. Verdun: Commandant Peuty in command of French air force in sector orders offensive patrols in formation to destroy German aircraft. Germany: Government tells US she will not postpone ‘unlimited’ U-boat war from midnight (actually intensified till end May). Italy: Italians seizes German ships in her ports. France: Maritime Transport Committee formed. Britain: ­National Volunteer Force accepted for Home Defence. Prohibited list of enemy firms in neutral countries published. Field Marshal French takes his seat in House of Lords as Viscount Ypres.